North Korea Officially Unveils Next Leader, Gives Media A Peek Kim Jong Il's youngest son, Kim Jong Un, was officially introduced Sunday as the country's next leader. Journalists were allowed into North Korea to cover the event, but this new openness has limits. 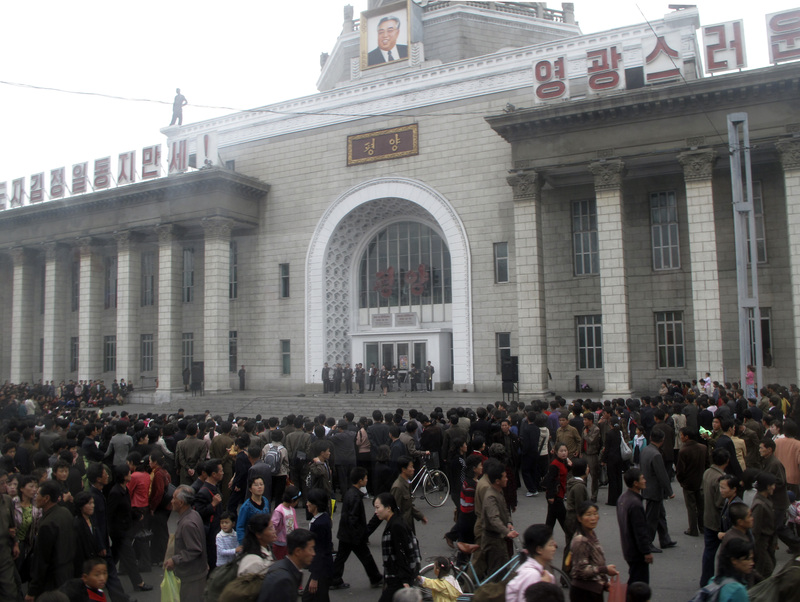 North Koreans attend a rally at a train station to celebrate the public unveiling of Kim Jong Il's son as the country's heir. Kim Jong Un, the youngest son of North Korean leader Kim Jong Il, was officially introduced to the world as the country's next leader Sunday. In an unusual move for the secretive nation, about 100 members of the international press were allowed to cover the enormous military parade. But North Korea's new openness has its limits. One day after the pomp and politics, the military parade plays on what seems like every screen in Pyongyang. For many ordinary people, it's the first time they've seen their future leader, Kim Jong Un, on TV, standing alongside the current leader, his father Kim Jong Il. As foreign press, we were given frontline access. Suddenly it seemed as if the Hermit Kingdom may have opened up a chink. Slipping out of the hotel without a minder in the early morning, I saw women scrubbing the sidewalks. In this image-obsessed city, some were even cutting the grass — with scissors. On an earlier trip, my every move was policed by a minder. But this time, things seem more relaxed, or perhaps more disorganized. In the backstreets, kids were playing basketball. Today is a holiday, marking the 65th anniversary of the worker's party. One young man, who gave his name as Kim, described how happy he was to see Kim Jong Un. "I think he's great, and he'll lead our country to a glorious future," he says. Not far off, I noticed a pile of corn heaped up inside a gate, and snapped a photo. Shouts erupted — it turned out to be a military compound. I beat a hasty retreat to the hotel. There, foreign ministry minders were organizing the media's official schedule: a visit to a concert at a workers' party monument, and an exhibition. This trip to North Korea has been devoted to politics and pageantry. After the massive military parade, we were taken to an evening gala, with fireworks, music and thousands of dancers. Our guide, Kim So Hye, said it was unprecedented. "This is something we've never had before," Kim says. "The size obviously is different, and the artistic level is somehow different. This is actually a very special occasion." This is art in the service of politics. Every part of the program has a political message. Most of it is reinforcing the history of the nation, and the legitimacy of the Kim family to rule. One section of the exhibition was devoted to CNC, a new catchphrase which has been linked to the Young General Kim Jong Un, and the march to modernization. As dancers in lime-green and orange satin whirled, our guide, Song Chaol, explained what CNC meant. "Computer numeric control system," he says. "We reach the high technology to make such kind of machinery by ourselves. Highest technology in the world." This entire gala is symbolic, with sections representing North Korean industry. As dancers run out with fake ostrich heads on their heads, the big screens on either side of the square display images of North Korea's ostrich farms — a pet project dreamt up by Kim Jong Il. It's wacky — but I have to say, the North Koreans do know how to put on a show. This is the side of North Korea we were brought in to see: these extraordinary mass performances. These are displays of unity and devotion, which serve to keep thousands of people busy for months. This is a regime obsessed with stage-managing its image to the outside world, and to its own populace. That's why the relative freedom we were given seemed surprising. But by mid-morning, the controls seemed to be back in place, as we trailed round a dusty exhibition hall. Just three hours after my impromptu morning stroll, a government handler approached me and asked to see my photos. "Somebody said you had taken pictures of army people," he says. This is a reminder of what life is like in a totalitarian country. North Korea's leadership may be inching toward a power transition; there may be a new face on the podium — but that doesn't necessarily mean reform is in the offing.